The information on SUP technique below will help stand up paddlers of all skill levels. Whether you have never entered a SUP race or are a seasoned SUP elite paddler, the stand up paddle stroke is the most critical part of your paddling experience. There is not one universal stand up paddle technique that applies to all stand up paddlers. Each paddler must find the technique that works best for them individually. Use the information below to learn the different elements of SUP technique that will help you paddle faster, longer, stronger and prevent injury. Same race, many different styles of strokes. During a race or training session a paddler will stroke through the water thousands of times. The way in which each of these strokes is performed is determined by a variety of variables. These variables include the paddlers experience, strength and equipment as well as the distance they are paddling and the conditions on the water. There is not one single SUP stroke rate and stroke type that I can tell you to use. Instead, you will need to find an optimal stroke based on the different variables of paddling that are unique to you and the water you are paddling on. In order to maximize performance, you should employ multiple stroke rates and types of strokes throughout the course of a SUP training session or race. Below are the stand up paddle stroke variables that can be applied to each stroke in a variety of combinations. The more connected a paddle is in the water, the more water it is grabbing, and the greater the power that can potentially be produced. Each paddle stroke can have a light, medium or heavy application of power. One option is not necessarily better than the other. A light stroke does not have much power but will generally have a higher rate; a heavy stroke will be more powerful and generally have a slower rate; a medium stroke will be somewhere in between. The connection that your paddle has with the water will determine how much power gets translated to forward board speed. You can have a powerful stroke where you exert a lot of effort, but poor connection with your paddle and therefore will not maximize your potential for a fast board speed. The poorer the connection, the less efficient your stroke will be. Concentrate on getting a solid connection with your blade regardless of the amount of power you are applying. The point in which the power is applied to the stroke can also change according to the paddler and the conditions. Someone who has a front-loaded stroke applies most of their power immediately after the catch and in the first part of the power phase. A paddler with a back-loaded stroke has a lighter catch with more power toward the back of the stroke. An evenly-loaded stroke has a relatively even distribution of power throughout the power phase. Stroke rate, also called cadence, is the speed at which a paddler enters and exits their paddle from the water. Don’t get tied to the numbers used for the examples below. Stroke rate is highly variable for each paddler and there is no right or wrong rate. I am simply quantifying stroke rate for the sake of the explanation. DO NOT try to stick to these rates as measurements for how you should be paddling. Stroke rate is heavily variable between paddlers based on their equipment, experience, body type, the conditions in which they are paddling and the total distance they are paddling. A slow rate usually produces a slow speed and is anywhere from 15-35 strokes per minute. This rate is in low intensity for active recovery, warming up and cooling down. A medium rate is around 36-44 strokes per minute. This is a rate that can be used for active recovery toward the low end and for a medium race pace intensity toward the upper end. A fast rate is anywhere from 44-60+ strokes per minute. This rate is for someone who has poor connection (slapping the water), sprinting, not applying power or as a race pace rate. Rhythm is a component of paddling that will improve as you perfect your overall stand up paddle technique. Take a second and imagine someone learning a fancy ballroom dance. When they first start to dance, they will likely be jerking all around the dance floor and not moving with rhythm, much the same way a novice stand up paddler will look. The more the dancer (paddler) improves, the more smooth their movements become. Why do we care about being smooth? A smooth rhythm will translate into an efficient stroke. Any unnecessary movements during each stroke essentially leads to wasted energy and extra strain on your body. A smooth rhythm will help you move faster with better technique while you conserve energy. Try using a mantra during the recovery phase of each stroke to help set up a smooth rhythm. For example you can say the word, “breathe”, and take a breath as you recover for the next stroke. An important factor to consider about stroke rate is paddling efficiently during each stroke. Remember, if you have a poor connection between your blade and the water, the energy you put into your blade will not produce forward board speed as efficiently as a stroke with a solid connection. Simply put, a powerful, fast, sloppy stroke with poor connection can result in much slower speeds than a slow, solid stroke with good connection. Finding the right balance between speed, power and connection is the key to finding your optimal stroke rate for different conditions and distances. This analogy vividly describes the variability of the stand up paddle stroke rate. The more gears a paddler is able to tap into through the course of a race, the better he/she will adapt to the various conditions and challenges presented on a race course. 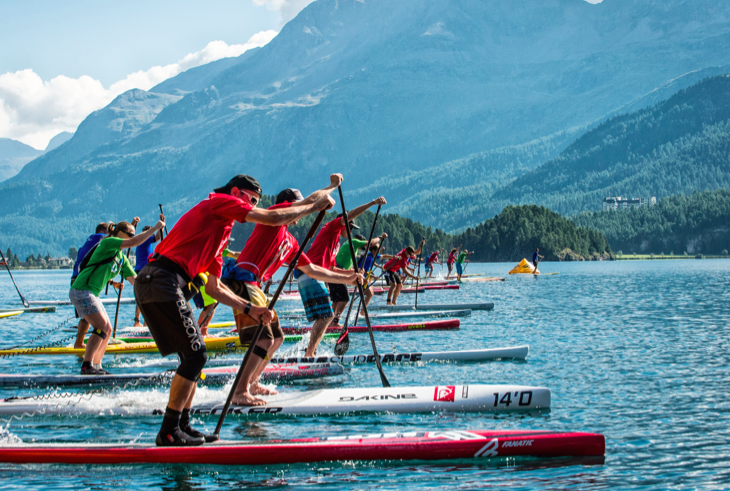 Work on each variable of the stand up paddle stroke to optimize your technique for SUP training and racing. You can also purchase the eBook, SUP Training The Smart Way, to learn more about optimizing your stroke rate and testing to find your optimal paddling gear.